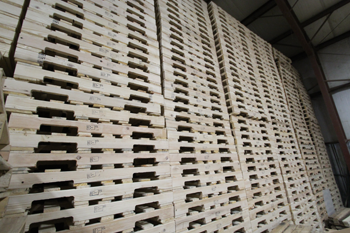 Arbor Industries, Inc. follows IPPC Guidelines to receive ISPM-15 Certification through Package Research Labs (PRL) to Heat Treat (HT) Stamp your wood pallets, crates, or lumber for International Shipping. Depending on what you are shipping, a different stamp may be required. Read below for an explanation of some of the guidelines for the different stamps. Don’t hesitate to contact us with any questions regarding your International Shipping needs. This stamp must be found on all lumber purchased to build heat-treated wood packaging for international shipments (unless the fabricator intends to heat-treat the finished product). While the wood a package fabricator receives must be marked with this stamp, once the fabricator cuts an HT-stamped board, there is no need to restamp the cut board with the HT-stamp because the Wood Packaging Quality Mark on the final container will serve the same purpose. This stamp is issued both to companies that heat treat lumber and lumber remanufacturers. This stamp is recognized by customs officials as the mark of a heat-treated product. It is required on heat-treated coniferous and nonconiferous packaging shipped internationally. The stamp is applied twice, on opposite faces of the completed container. This stamp is not used on individual pieces of lumber. If a package only has the HT-stamp, it will be rejected by the receiving customs officials. Its use is required by the ISPM 15. 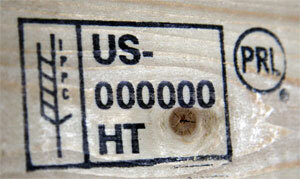 This stamp is used to mark heat-treated wood used for dunnage in international shipments. Each piece of lumber must be stamped every 2 feet. Dunnage is defined as wood packaging used to secure or support a commodity, but which does not remain associated with the commodity.